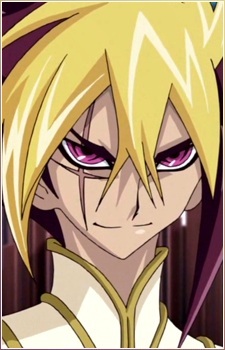 He is a participant in the World Duel Carnival and the Asian Champion of dueling. IV is a malicious and cold person who is willing to do anything in order to succeed. When in the presence of his fans, his personality becomes a facade as he hides his true nature and becomes a "noble" and "well-mannered" person. He sees his fans as bad duelists and challenges them as his "fan service". When he duels, he praises their skills and lets them think they have the upper hand. When his opponents fall into his trap he shows his real self and defeats them cruelly, going so as far as to keep attacking his opponents even if they have no Life Points claiming his "fan service" must continue. He argues a lot with his brothers too, showcasing that he is willing to let his personality get in the way of their true goal and doesn't like obeying Tron's orders, unlike III and V. He also seems to have have a slight fear of V, shown when he got intimidated after V got mad at him for talking back to Tron. Despite IV's apparent cruel behavior, he does show regret for some of his transgressions, describing them as "inhuman", saying he had done it all for his father's sake. He later apologized to Shark for hurting his sister, claiming he had no intentions of doing so, by playing a card Tron gave him, and even asked Shark to save his father. Like his brothers, he only followed Tron's orders and wanted to defeat Dr. Faker with hopes that doing so returns Tron to his normal self, Byron Arclight. He is later revealed to be the son of Tron (Byron Arclight) and brother of III and V, with his real name being Thomas Arclight.